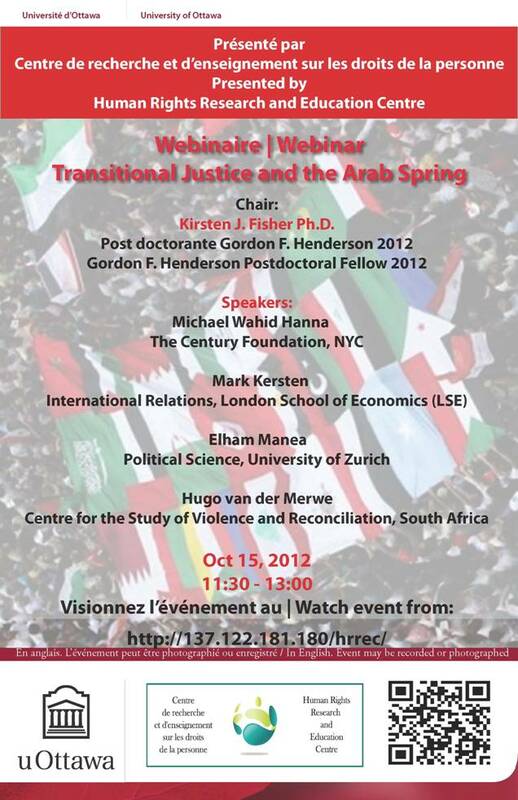 For anyone interested, please tune in to a ‘webinar’ on Transitional Justice and the Arab Spring from 11:30 – 13:00 EST (16:30-18:00 GMT) tomorrow, Monday, October 15. There is a great list of participants and it promises to be an interesting examination of questions regarding the use of transitional justice mechanisms in Arab Spring states. Much of the discussion will center around questions that Kirsten Fisher raised in her two-part post, Distinctly Arab? Questions about Transitional Justice and the Arab Spring (see here and here). I will be presenting findings from my paper, Justice after the War: The ICC and Post-Gaddafi Libya and comment on some new developments, focussing on the admissibility hearings at the ICC last week. If you’re keen, check out the poster below for more details! This entry was posted in Arab Spring, JiC News, Transitional Justice. Bookmark the permalink. In addition to the speakers on the poster, Habib Nassar will also be joining us. Habib is the former Director of the MENA program at the Int’l Centre for Transitional Justice and currently the Middle East and North Africa Director at the Public Interest Law Network.